The PocketBook 360 Plus is ideal for travelling. Its small size and hard screen cover make it perfect to carry in your pocket. Thanks to E-ink technology, the e-Reading experience is virtually identical to reading ink on paper. The screen displays texts and illustrations in 16 shades of gray, providing an easy-on-the eyes experience. Unlike LCD screens which can flicker and cause eye strain, you can enjoy reading the Pocketbook 360 Plus with no harm to your eyesight. The high resolution 5” screen (200dpi) delivers a high contrast sharp image, wide angle of visibility, and no patches of reflected light. Plus, it’s simple to change the text size and font. 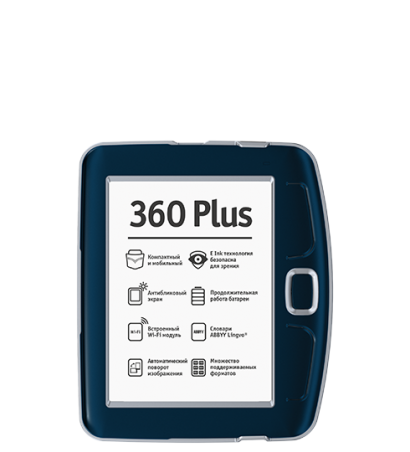 The PocketBook 360 Plus comes with a new processor and twice extended operating memory. In addition, the page flip speed is doubled because the screen mode update doesn’t use blackout*. To test the PocketBook 360 Plus’ performance, we conducted an experiment in which we successfully ran the game Doom. Check it out proceeding the link. The Pocketbook 360 Plus provides you with wireless freedom to surf the Internet and browse most of Web pages. In addition, its RSS reader lets you add news feeds. A built-in Wi-Fi module, RSS reader, and mini Internet browser supported by Java technology make it all possible. 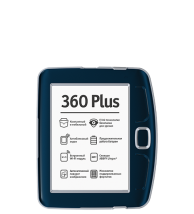 2 Gb of extended flash memory, which actually uses only 1.4 Gb of the space, allows the PocketBook 360 Plus to store up to 4,000 books. In addition, a micro SD slot and micro SDHC slot can increase the memory up to 32 Gb. A single battery charge delivers enough power to read about 10 books -- about 8,000 page flips or one month - without recharging the battery. The PocketBook 360 Plus uses Adobe software adapted exclusively for PocketBook International. This app makes it possible to open protected files in EPUB and PDF formats. In addition, it allows you to read DRM protected files. The PocketBook 360 Plus arrives completely ready for use with all of its functions built in. There’s no need for any additional devices, a PC or software installation. Pocketbook International constantly improves its products and increases the number of available features and functions. This model includes all of the latest updates and newly developed functions, increasing its functionality and effectiveness and making the reading experience more enjoyable. All Pocketbook devices support almost all current file formats for e-books: EPUB DRM, PDF DRM, HTML, DJVU, RTF, TXT, PRC, CHM, DOC, TCR, FB2, FB2.ZIP. Using your eReader to find and purchase a book is really easy at PocketBook’s own book store, BookLand.net. Thanks to this unique feature, you can instantly access and view your notes and bookmarks without leaving the book you’re reading.